At We Smile Dentistry, we understand your family’s health and happiness is your top priority, it’s ours too! That’s why we work hard to make quality dentistry convenient and affordable for you. Oral health is an essential part of a healthy life because your mouth and your body are a lot more connected than you may realize. A healthy smile allows you to speak properly, to feel confident, to eat a healthy diet, and can even help prevent serious health problems like heart attack and stroke. If you leave tooth decay and gum disease untreated, your overall health is at risk. Keep your defense strong by eating healthy, maintaining good oral hygiene and visiting your London dentist regularly for cleanings and exams. Oral hygiene is the foundation for oral health. Regular brushing and flossing and visits with your friendly hygienist are essential for eliminating the acid and bacteria that cause tooth decay and gum disease. We won’t shame you if you haven’t been flossing, we’re all human after all, but we will encourage your efforts if you wish to avoid larger, more painful and costly complications down the road. Invest in an electric toothbrush. Sonicare® and OralB makes great electric tooth brushes. Brush every day at least twice, in the morning and before bed. Brush your tongue to eliminate bacteria that causes bad breath, tooth decay and gum disease. Floss every night before bed to eliminate plaque between teeth. Rinse with mouthwash to kill more bacteria in the rest of the mouth, between teeth and on the tongue. Swish with water after meals or when brushing and flossing is not available. Gum disease affects most of the adult population, and many people are entirely unaware they have it. Many people are also unaware that an estimated 50% of all heart attacks are caused by the bacteria associated with gum disease, and that left untreated, it can significantly increase your risk for other systemic health problems including heart disease and stroke. If your gums bleed at all when you brush or floss, sorry to tell you, you have gum disease. It may only be in the early gingivitis stage, so the good news is we can treat it with some simple improvements to your oral hygiene routine. Other more advanced cases of periodontal disease or periodontitis require more advanced treatment methods. If you’re suffering from gum disease, Periowave laser technology targets infected cells and leaves health cells intact, eliminating the infection and creating a healthy environment for healing. With Periowave, we can treat gum disease without invasive surgical techniques. Periowave offers a more comfortable experience with better results than ever before. Click the infographic to learn more about gum disease including causes, symptoms, risk factors, and health consequences when left untreated. Since November 2015, 2003, Ontario has mandated the use of Amalgam Separators in all dental offices that place, repair, or remove dental amalgams. The negative impact of waste dental amalgam to our environment was the reason behind this decision. By May 8th, 2010, the Canadian government created a plan that agreed and supported the Ontario plan. In the early nineties, we decided to greatly decrease our use of dental amalgam, and by the mid-nineties we stopped using dental amalgams. This was done to decrease the potential negative environmental impact. Over the previous ten years, the quality of tooth coloured dental materials had greatly improved, and by the mid-nineties was approaching the performance of dental amalgams in many situations. While all oral health problems are serious, this one is deadly, and is a great reason to see your dentist regularly for exams and screenings. We are always on the lookout for any changes or abnormalities that may be signs of decay, infection, or oral cancer, and you should be on the lookout for them at home, too, especially if you fall into any of the high-risk categories. 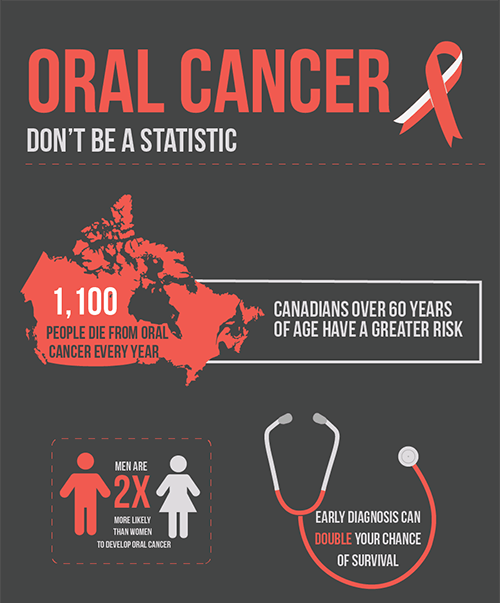 Oral cancer is unfortunately on the rise in the Canada, but early detection significantly increases your chance for recovery. At We Smile Dentistry, we use VELscope® oral cancer screening technology to conveniently and safely screen for oral cancer, free of charge. Velscope requires no rinses or dyes, all you have to do is open up and we’ll use the small handheld device to illuminate any tissue abnormalities. The process is quick and painless, it only takes about two minutes, and it might just save your life. Click on the infographic to learn more about oral cancer including risk factors, signs and symptoms. If your little ones (or you!) are involved in any type of contact sports, you’ll need a good mouthguard to protect their teeth and face. While any mouthguard is better than none, you do have a few options to choose from. Stock mouthguards from the sporting goods store offer a certain level of protection against tooth loss but aren’t designed to fit their mouth so it won’t fit perfectly or be very comfortable. Boil and bite mouthguards are more customizable. They are designed to be boiled and then molded to fit the mouth. These are a step up from a stock guard. Custom mouthguards are individually made to fit each mouth perfectly, offering protection against tooth loss and may help prevent concussions. We offer custom mouthguards at We Smile Dentistry. Mouthguards help protect teeth in many ways, not just on the field. If you suffer from bruxism (teeth grinding) or TMJ/TMD, a custom nightguard can help minimize the wear and tear on your teeth and allow your jaw joint to rest and heal overnight. If you or your partner snore through the night, and it’s putting a strain on everyone’s quality of sleep and quality of life, we’re happy to offer custom snoreguards. Learn more about snoreguards on our Sleep Apnea page. If you have any questions about general dentistry or would like to schedule a visit, please give us a call at (519) 661-0042 or get in touch with us online. Your London dentist, Dr. Giulio Spagnuolo and our team at We Smile Dentistry look forward to smiling with you! Serving smiles from London, St. Thomas, Lucan, Dorchester, Strathroy, and beyond!